Summers are $600/nt base + 11% tax/rec, and $225 cleaning, Saturday to Saturday. Fill in dates 7 night minimum won't apply. Three day holiday weekends you can add a a fourth night free, high season rates. Winter break, five night minimum, $550/nt + 11% tax/rec + $225 cleaning. It's bigger than it looks!! Two minute walk to Village. A/C added. Remodel. 3000sq.ft with 6.5 baths /6 BR (5 masters), featuring four bedrooms on the main floor plus game room with queen Murphy bed. One totally private loft room upstairs with king bed and full bath. Foam mats in game room. The house is much bigger than it looks in the front photo. Almost everything on one level. Fun stuff, Hi-Speed WiFi, CD Jukebox full of oldies, pinball, arcade games, and TV with 400 movies. Living room 28' x 16' with corner gas heating fireplace, wall mounted 70" flat screen TV, skylights, bay window, and French doors. Big hot tub on private deck. Well equipped kitchen, remodeled , maple cabinets, granite counters, all base cabinets with pull out shelves, stainless appliances. Huge lot with lots of common ground beyond. Big deck and paver patio. Outside Smoking Only. Ten Bikes. Two minute walk to grocery store and Country Mall with video and game rentals, ice cream shop, coffee shop, 13 restaurants within a five minute walk (Subway to Dinner houses). Quiet area close to swimming pool,(SHARC passes included year around) tennis courts, bike trails, and Sunriver Lodge. I've been a seafood broker at my own one man company, Carlson Seafood in Portland, OR. We also did some real estate investing leading to four Vacation rentals. We love Sunriver and Central Oregon with all it has to offer. Our summers are usually spent in Bend in a tiny downtown house. We like to be handy for anything that comes up at our Sunriver houses. We take pride in our houses. This is one of the most convenient locations in Sunriver. 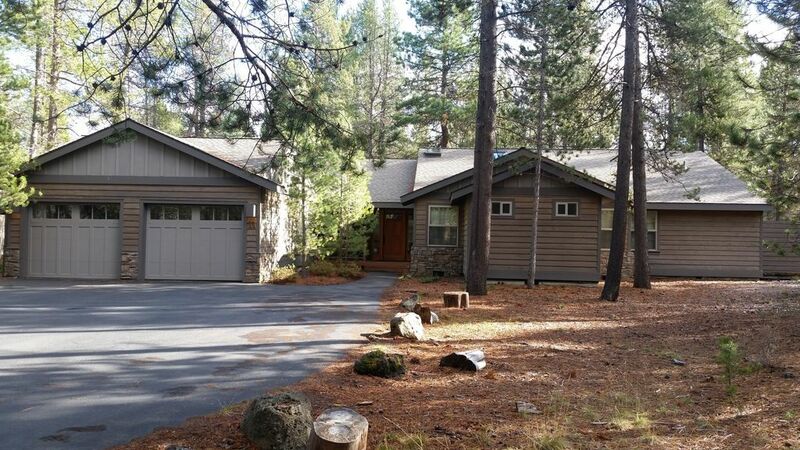 Short walk to SHARC, two minutes to the Sunriver Village. Hugh lots (16,000 sq. ft.) with lots of common ground. Grocery store is also a two minute walk. Forgot the salsa for the tacos? 'Back in five minutes with what you need. We have two houses on Backwoods Lane because of the location, we think it's the best. It doesn't show on the map but Backwoods is a circular lane with 12 houses. Huge island in the middle for a safe controlled play area. Frisbee golf, perfect. Great for noise control. Living area on one end, bedrooms on the other. No noisy upstairs open lofts. Great for early risers and night owls too. Commercial washing machine with two full size dryers. Huge driveway. See photos. No side of the road parking in Sunriver. Driveway parking is importnat. 70" in living room, more throughout the house. This was a great home for the 6 adult couples in our group. There was plenty of seating for meals and socializing, the jukebox was fun addition and the game room was a complete hit for us "older kids". It was also close to the bike paths for walking and quick runs to the store or village for shopping. We will definitely look at booking here again! We stayed at Backwoods 11 over the first weekend in March 2019. We could not be happier. The home is ideal for big families, mixed families with kids, and couples, especially where having some privacy at night is ideal. Each of the 5 bedrooms has a en suite, private bathroom. Two bedrooms have extra bed for couples with small kids. All rooms are large. The 6th bedroom (we did not use) doubles as a second family room. It's bath is not en suite, but there is a 6th bathroom. If needed, there is a 1/2 bath off the laundry room. Rooms are clean, lite and open, beds seem new and just right (not too hard, too soft). Kitchen is perfect for those wanting to cook for large groups. Many pots, bowls, utensils, all great quality. Lots of counter space for making the dinner a group effort. Great dinning table, plus another small (for 6) table in the family room make for plenty of room for a sit down dinner. Family room is furnished in a comfortable way with a great layout. TV is there, but we barely turned it on. Jukebox for music was a lot of fun. Owner's instructions were clear and easy. Would rent here again in a heartbeat. We spent 5 nights here and loved it! We were a group of 12 (6 adults, 6 kids ages 3-11). Everyone was very comfortable and really liked that each bedroom had its own bathroom! There were ample seats at the dinner table for all of us. Very easy walk to the village. The hot tub was an added bonus plus there was lots of space for the kids to play in the snow in the backyard. I have stayed often in VRBO rentals and this was the best stocked accommodation of all of them. None of us wanted to leave and are already talking of going back. This home was more than we expected! Overly equipped with everything we needed. The game room was a hit from the youngest to the oldest. Location was amazing! We will return. Comfortable well-furnished home with plenty of bathrooms - great for large family gathering! We had a wonderful time with our family. We rode the bikes and enjoyed the pool passes. It was great to be close enough to walk to the store for a last minute dinner ingredient. Beds were very comfortable and there were plenty of dishes. We had a refrigerator issue and Craig ordered a new one delivered. But until then there was a spare in the garage, and a freezer too. We could have brought a month's worth of food! Thanks! Great location and house! Very comfortable and plenty of space! Kids and adults loved the game room and dancing to the music! House is very well stocked! We had a great time! Hi, Thank you for the nice review. WE do like pleased guests. Rate notes Summers fill in days may work without minimums. Cleaning Fee $225 *FREE NIGHTS! 3rd NIGHT FREE! (except school holidays) 4th NIGHT FREE! (holiday weekends - except July 4) 5th NIGHT FREE (Thanksgiving) Ask for details. (Quote will not reflect Free Nights). *Short Term Rental taxes, State and County combined 11% SHARC/Recreation Passes will be added to nightly rate. $25/nt gives you 10 reusable passes. *A cancellation of this reservation for any reason will result in a $300 charge.